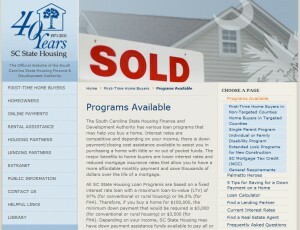 Are you thinking of buying your first property in South Carolina? Would you like a free gift of money to help you purchase that first home? If you answered yes to these two questions, there is great news for you. The state of South Carolina provides free grant money for its residents who are buying a home first time and need help with the down payment and closing costs. This funding comes in the form of state grants for South Carolina residents that fall under certain income limits. This is free money that shouldn’t be passed up! The grant awards can be in the thousands of dollars. It will be well worth your time to educate yourself about the grant programs that the State of South Carolina provides. The agency in South Carolina that provides funding and grant assistance to first time home buyers is the South Carolina Housing Finance and Development Authority. There are a few varieties of grants available, depending upon your income. You can get a Down Payment Assistance Loan for up to $4,000, depending upon income. This loan can be completely forgiven if you live in your home for 5 years, which makes it effectively a grant. 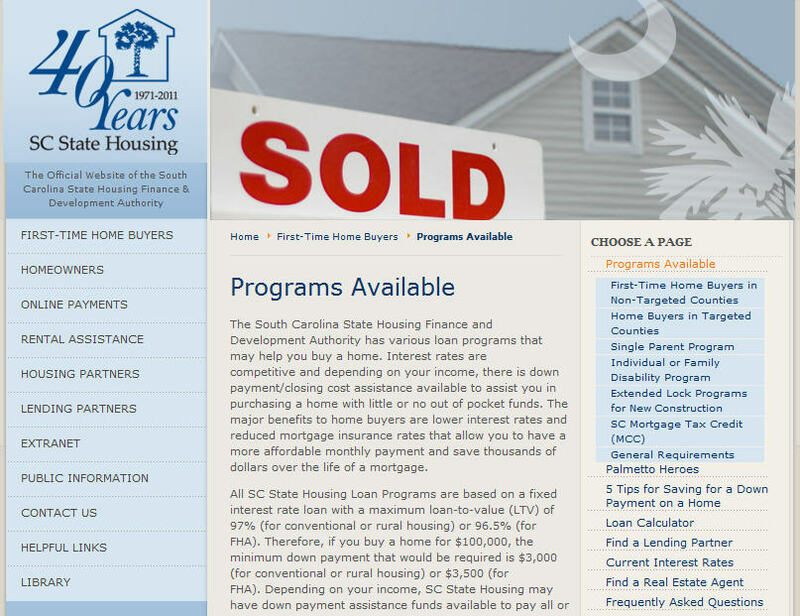 To find out more about which grant programs you may qualify for, please visit the South Carolina Housing Finance and Development Authority website page specifically describing the varieties of grant programs. You can go to that page by checking this link. The South Carolina State Housing Finance and Development Authority has various loan programs that may help you buy a home. Interest rates are competitive and depending on your income, there is down payment/closing cost assistance available to assist you in purchasing a home with little or no out of pocket funds. The major benefits to home buyers are lower interest rates and reduced mortgage insurance rates that allow you to have a more affordable monthly payment and save thousands of dollars over the life of a mortgage. Down Payment Assistance of $4,000 is available for all first time borrowers qualifying in the Category II income limits and home price limits. The $4,000 Assistance consists of a $4,000 Forgivable Second Mortgage. The assistance can be used for the down payment, closing costs or pre-paid costs in the purchase of a single-family dwelling. Besides the state programs for buyers of their first property, there are federal funds and grants available to the home buyers in South Carolina through the Homes and Communities program of the United States Department of Housing and Urban Development. On their website you’ll find complete grant information, application forms, description of available funds, as well as many other helpful tools. Every potential home buyer should investigate the programs have to offer. You can visit the website by going here: US Dept. of Housing and Urban Development. Also, there is a website that has a complete list of all grant programs available through the United States Federal Government: Grants.gov. You should plan to spend the required time investigating to determine how many individual grants you may qualify for. You can visit the website by going to Grants.gov and searching for more information. This entry was posted in Down Payment Assistance, First Time Home Buyer Grants, First Time Home Buyer Info and tagged down payment assistance, Down Payment Assistance Loan, HUD grants. Bookmark the permalink.